The Government is duty-bound by European law to ensure that specified air quality standards are met as quickly as possible. However, the Court of Appeal has ruled in an important test case that that duty does not extend to a general obligation to refuse planning consent for particular developments that might contribute to atmospheric pollution, including those raising the ambient level of nitrogen dioxide. The case concerned a local authority’s resolution to grant consent for a mixed-use development, including 4,000 new homes, on the outskirts of a city. It did so in the light of a pressing need for more homes in the area and after the developers agreed to spend £3.7 million on air quality measures, including a monitoring regime, the installation of electric vehicle charging points and the provision of one electric bicycle per dwelling. Local campaigners challenged the Secretary of State for Housing, Communities and Local Government’s refusal to exercise his powers under Section 77 of the Town and Country Planning Act 1990 to call in the planning application for central government determination. That decision was said to be irrational and a breach of his obligations under Directive 2008/50/EC (the Air Quality Directive) and the Air Quality Standards Regulations 2010. Those arguments were, however, rejected by a judge. 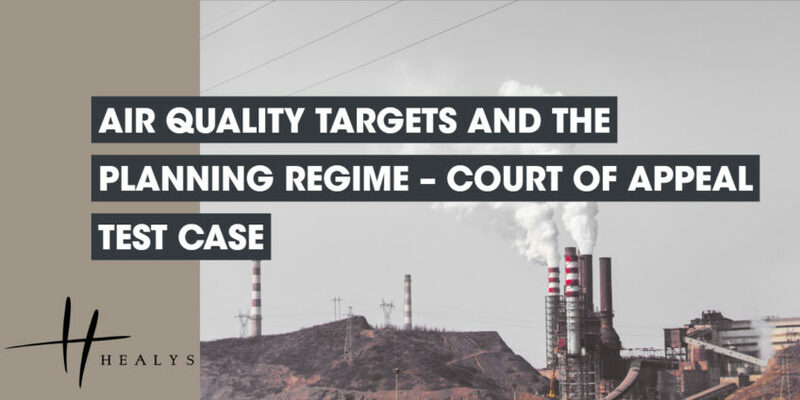 In dismissing the campaigners’ challenge to that ruling, the Court noted that air quality is a material planning consideration that can in some cases prove decisive. There was, however, no authority to support the view that the Secretary of State was constrained to exercise his very wide discretion in favour of calling in the planning application. Neither the Directive nor the Regulations had the effect of narrowing that discretion or transforming it into a duty. The Court noted that the Secretary of State’s primary duty under the Directive is to prepare and implement a compliant air quality plan. It rejected arguments that, as the competent authority tasked with enforcing the Directive, he also owes a general duty to use his powers in respect of individual planning applications to avoid the worsening or prolongation of breaches of prescribed nitrogen dioxide limits. There was also nothing perverse about the Secretary of State’s decision, in that he was aware that the local authority could reconsider the planning application, taking into account any further representations made by objectors. The council had confirmed that it would carry out such a reconsideration and would pay particular regard to the likely effects of the development on air quality. On the basis that the meaning of the relevant provisions of the Directive was clear, the Court declined to refer the case to the European Court of Justice.